The best Allied jet fighter to emerge from World War II, came about in September 1943 when Allis-Chamlmers encountered problems making the De Havilland Halford H1 engine (as the J-36) under license, when it became apparent that the J-36 would never be made, Lockheed designed the L 141 which was an enlarged XP-80 fitted with the General Electric I-40(J 33). The USAAF was so impressed that they ordered two prototypes strait away as the XP-80A. A number of changes were made from the XP-80 such as the fitting of dive brakes under the fuselage, redesigned air intakes, changes to the wing & tail, increased fuel and ammunition capacity, new undercarriage and the fitting of a pressurised cockpit. Altogether the XP-80A was around 25% heavier that the XP-80. The first XP-80A flew for the first time on 10/6/1944, with the second aircraft followings on 1/8/1944 this was fitted with a second seat for an engineer. In March 1944 thirteen pre production aircraft were ordered even before the XP-80A had taken to the air! 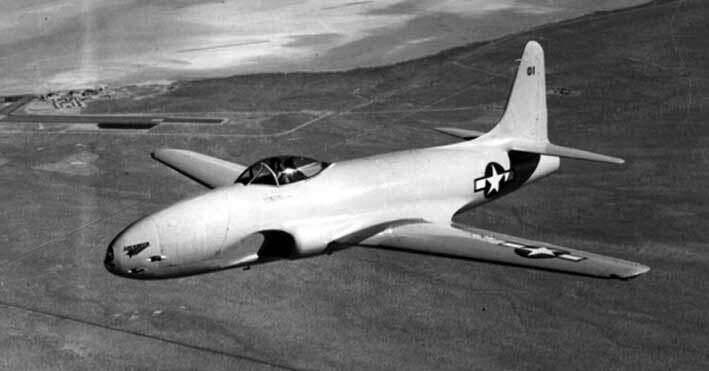 named the YP-80A, they were more or less identical to the XP-80A. An order for 1,000 aircraft was made on the 4/4/1944, followed in July with another order for 2,500 aircraft, this was however canceled after VJ Day with the first contract being cut back to just 917! The first YP-80A took to the air on 13/9/1944, with delivered to the USAAF starting in October 1944, followed by deliveries of the production aircraft, the P-80A, December 1945. All early P-80As had a gloss light gray finish, this proved hard too maintain in service so was changed to a natural metal finish. In December 1944 Four YP80As were deployed to Europe to boost the morale of the USAAF combat crews, the four YP-80A's were sent to England for tests and demonstrations were two crashed the first in mid December killing it's pilot and another in November 1945. Two were sent to Italy in April 1945, where they actually took part in operational sorties. The "Shooting Star" would go on to have a number of firsts under it's wings,the most notable being in the first Jet-versus-Jet combat (which it won) and is still in service in parts of the world as a trainer the T-33.